The art exhibition of Li Wang was held on October 11 at the Salomon Arts Gallery in Tribeca, New York. Located in Downtown New York, Tribeca has witnessed the vicissitudes of the contemporary art in New York. Tribeca was the most popular gathering place for a generation of artists with art dreams thirty years ago. It was known as the most disappointing place for the robbers, because every early evening, the street corners, coffee houses, cafes, galleries and everywhere in this area were filled with passionate artists, such as Broadway actors and actresses, film directors, screenwriters, painters, writers and university professors. They would, with a few bottles of beer and packs of cigarettes, discuss and debate with each other all night long. The robbers waited for the whole night, only to find those artists with learned minds but empty pockets. Finally, they decided to give up this disappointing place. Nowadays, this area, with high land cost, has become a district of the most avant-garde and trendiest art and culture in New York. A vast number of successful financial figures also pour into this area with funds with complacent to earn themselves a place here. Salomon Arts Gallery is selected for this individual exhibition “Crossing — Li Wang Contemporary Ink Painting” because it is the best witness of the vicissitudes. In the early 1970s, it served as the rehearsal venue for dancers and directors. Later it began to hold art exhibitions. This current one marks its first cooperation with Chinese artists. The three-week exhibition includes three theme events: opening reception, closing reception and dialogues with the artist. It aims to offer a platform for interactions and communications with the local guests as well as one for experiencing and promoting ink paintings and its education. In addition, it has run through the vicissitudes and development of various arts in the same period under different cultural backgrounds. At the opening reception, Li Wang made brief communication and interaction with the guests. The guests were encouraged to experience the feeling of wearing red scarves. As a result, the scene was bright red all at once. In the meantime, Ma Chunyan was invited to perform Chinese tea ceremony for the guests along with her homemade champagne tea and Chinese cakes, which lit up the impassioned and amazing atmosphere for the always curious and open-minded New Yorkers. During the dialogues with the artist, the guests brought many in-depth questions to Li Wang, which attached profound meanings to the communication, including the preservation of Chinese ink paintings; the value and positioning of ink paintings in the international markets; the contribution and responsibility of Chinese ink painting artists to the contemporary art; the difference between Chinese traditional and contemporary ink paintings; and the humanistic concerns of Li Wang’s personal works on the society. Starting with a movie clip titled “Story of Red Scarf,” Li Wang introduced the ideal way of living for Chinese people thirty years ago, the cultural origin of ink paintings, how to appreciate them, and the philosophically leisure attitude toward life of the Chinese people and other issues. His demeanor and erudition won himself high regards from the guests. 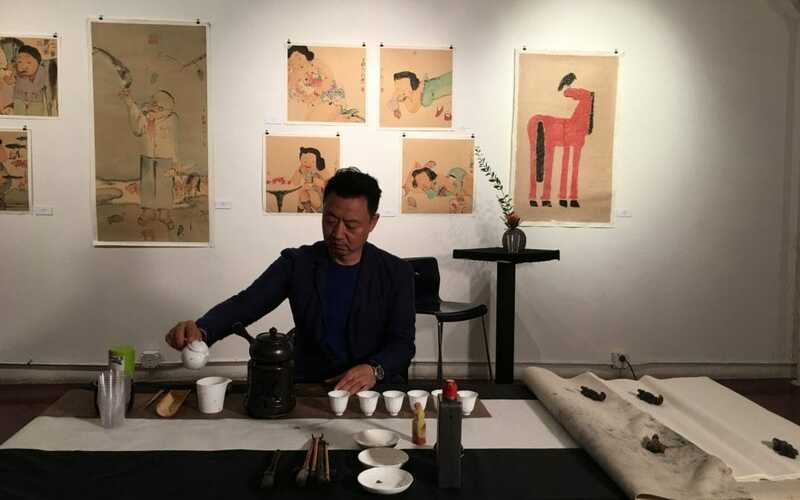 At the same time, the interaction between Li Wang and the guests in experiencing the tea ceremony and ink paintings became one of the highlights of the whole exhibition, which also attracted many overseas collectors. The world is separated, but also well united. Using art to display the wonderful life has always been a shared topic among human beings. Li Wang’s art works are to carry and spread the Chinese ink painting culture with this charm. Thirty years ago, Tribeca of New York might not expect that the same street would be filled with the fragrance of ink and tea, the ancient culture from the other side of the world, on such an autumn evening of October 2017.